Some classics are coming back to Cartoon Network. Today, the network announced their programming lineup for 2017-2018. Returning shows include Teen Titans Go!, The Powerpuff Girls, Adventure Time, Steven Universe, Mighty Magiswords, and We Bare Bears. · We Bare Bears – The BAFTA Award-winning series created by Daniel Chong stacks up a third and hilarious season. In the newest season, Grizzly (Eric Edelstein), Panda (Bobby Moynihan) and Ice Bear (Demetri Martin) meet up with favorite friends and frenemies voiced by Patton Oswalt, Charlyne Yi, Jason Lee, Ellie Kemper and Cameron Esposito. The adorable baby bears add more hijinks and commotion to the delight of fans. Festive holiday specials and new guest appearances by comedian Ron Funches and notable voice actor John DiMaggio round out the season as the Bears continue their comedic adventures around the Bay Area and beyond. 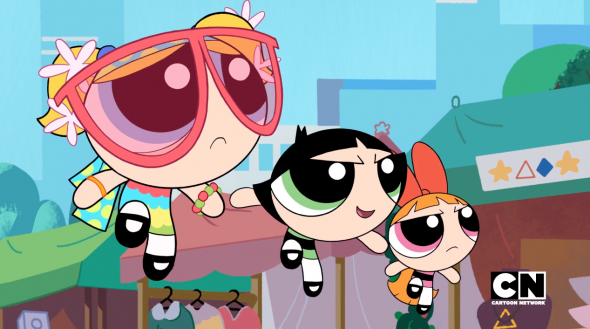 · The Powerpuff Girls – The Emmy nominated series is back and kicking off a second season featuring all-new characters and specials, plus action-packed battles between the superhero sisters and fan-favorite villains HIM and Mojo Jojo. The newly reimagined series is executive produced by Nick Jennings and co-executive produced by Bob Boyle, and will continue to further Cartoon Network’s commitment to STEAM education with two additional themed episodes this season. The wildly successful online Powerpuff Yourself avatar maker, which reached over 12 million fans at its launch, has now been updated so even more fans can see themselves as a real Townsville superhero. The original series was created by Craig McCracken. · Mighty Magiswords – Recently picked up for a second season, Mighty Magiswords will expand on Prohyas and Vambre’s epic adventures as they embark on more hilarious quests in pursuit of the latest and greatest Magiswords to add to their coveted collections. Created by Kyle A. Carrozza, Mighty Magiswords is comprised of a rich hub of more than 500 pieces of original content including interactive shorts, narrative vlogs and a multitude of immersive digital games and apps. · Adventure Time – The Emmy and Peabody Award-winning show is back with an eight-part mini-series of epic proportions later this year. Fans will be just as surprised as Finn to discover what happened to the kingdoms of Ooo while he was away at sea. This next mini-series comes fresh off the heels of Adventure Time: Islands, which reached almost four million people. The series is created by Pendleton Ward and executive produced by Adam Muto. · Steven Universe – Friendships are tested as the saga continues in this Emmy-nominated series, created by Rebecca Sugar. The show returns with new adventurous story arcs and specials, in which fans will meet more Gems, spend time with the Diamonds and gain insight into the ever-mysterious Gem Homeworld while the series’ titular hero Steven Universe will grow as a leader. Steven Universe is lauded for having a voice of inclusion, and was recently nominated for its first GLAAD Media Award in the Outstanding Comedy Series category. · Teen Titans Go! – Season four of the hit series continues and get ready for the show’s 200th episode as Robin, Starfire, Raven, Beast Boy and Cyborg prepare to save the world in a special, two-part episode. Audiences are also in for an egg-ceptional treat in a spring special featuring the mythical Tooth Fairy who tries to take over the holiday from the Easter Bunny. Series is produced by Warner Bros. Animation. What do you think? Do you watch Cartoon Network? What’s your favorite show? More about: Adventure Time, Adventure Time: canceled or renewed?, Cartoon Network TV shows: canceled or renewed?, Mighty Magiswords, Mighty Magiswords: canceled or renewed?, Steven Universe, Steven Universe: canceled or renewed?, Teen Titans Go!, Teen Titans Go! : canceled or renewed?, The Powerpuff Girls (2016), The Powerpuff Girls (2016): canceled or renewed? I rather watch Original Teen Titans better than Teen Titans Go!. This is for all of the Original Teen Titans fans.